This is the example of a json file. Now let me show you how to read and parse through above json file using php. To read json file with php, you must first get the json data stored in the file, decode json and finally parse through the array or object. For that you'll need two php functions - one is file_get_contents() and the other is json_decode(). Note: The function json_decode() decodes the given json string into an array or object. For example the statement json_decode($data, true); in above code will return associative array. You can ignore the second parameter 'true' to make it return as an object. To add additional records to json file you have to simply append it to the end of file. Here let's see an example for adding new data. The following php snippet takes up a json file, decode it, add extra records and again encode to json and save it into a new file. As for updating json file you can either modify single value or in bulk. Here's an example for modifying value for a specific json attribute. Here's what the script does. JSON deletion is little complex since it is easy to mess up doing the process. You must be clear what you need to delete first, a specific key pair from all rows or a complete row. 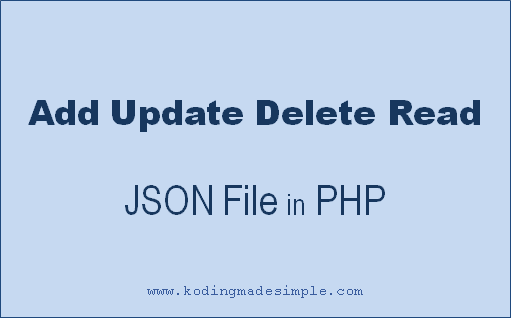 For example this php script will delete entire record from json containing key 'Code' as '2'. And this is the file we get after deletion. The deletion script uses two foreach loops. The first one is for determining the array index we need to delete from json. And the second is what actually deletes from array using unset() function. Finally it rebases the array, encode it to json and store it in a new file. I hope you like this tutorial. Please don't forget to share it with your friends.